These pots and seeds are waiting on my kitchen counter for me to plant tomorrow. Five or six types of broccoli, raab, broccolini, etc - we love broccoli. Also flowers: cosmos, cleome, tithonia (Mexican sunflower), nigella, and bells of Ireland. 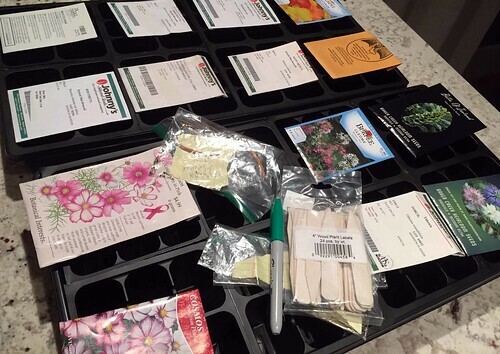 I have a whole bunch of seeds to get planted too...I was waiting for my hubby to set up my lights and shelves, but that never happened, so it looks like I'll have to do it myself! Hmm. Sure seems like that should be a hubby task...Kidding. I bet you can do it.